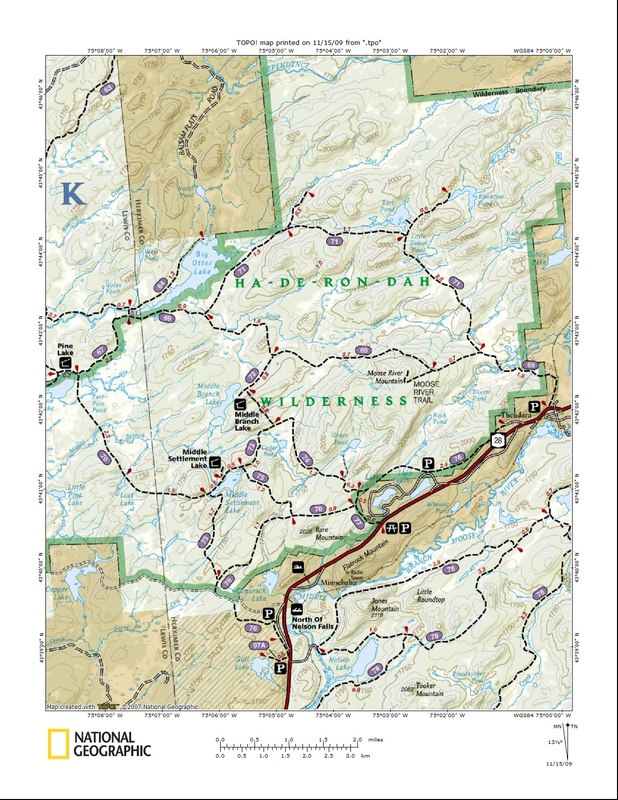 Get this pdf guide for only $5 featuring info about the hiking trails in this wilderness and maps to assist in planning your adventure. Use the "Buy Now" button below and we'll email you the pdf of the guide direct from CNY Hiking, usually within 24 hours of receiving payment. 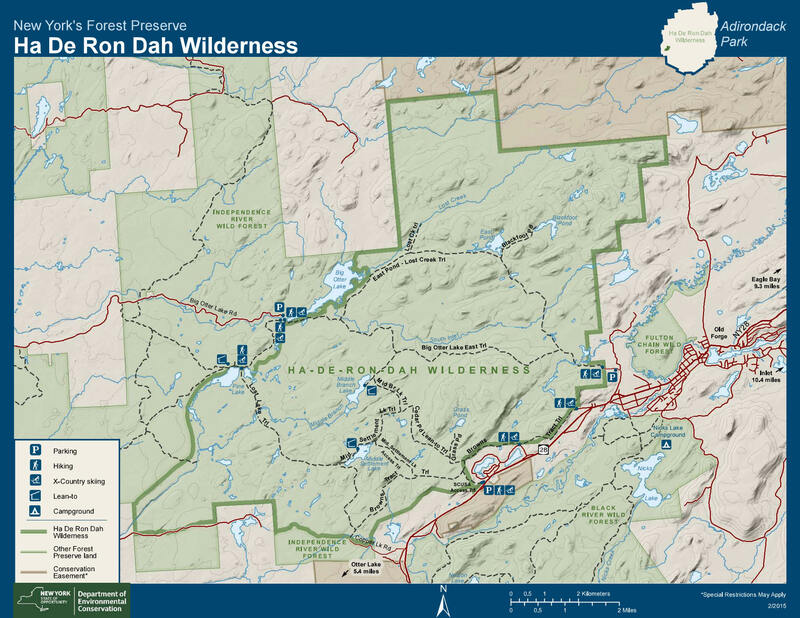 The 26,600 acre Ha-de-ron-dah Wilderness is in the western foothills of Adirondack Park, west of the popular tourist destination of Old Forge. This popular area in the Adirondacks is easily accessed off NY 28. 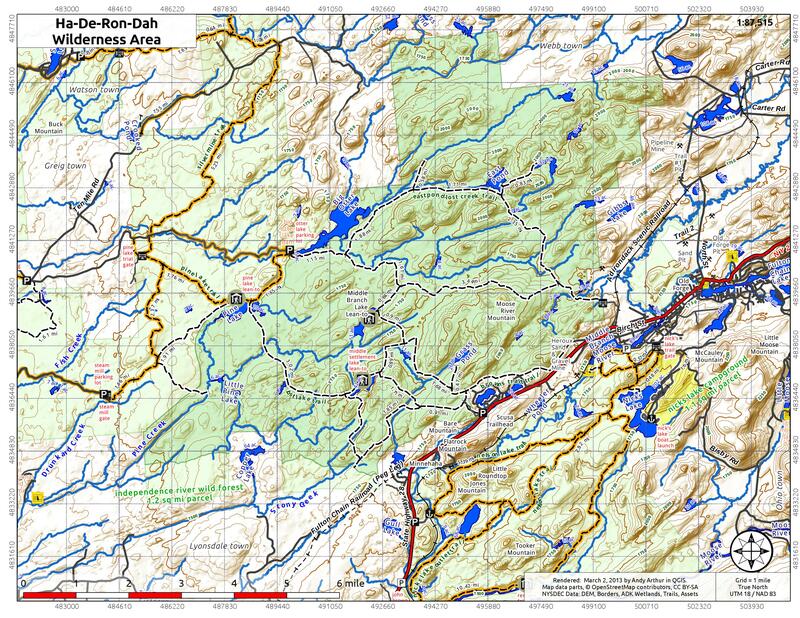 There are nearly 35 miles of marked hiking trails located in Ha-de-ron-dah Wilderness. There are four popular bushwhacks for those who like going off trail can attempt. Cross Hill, Six Mile Hill, Coal Hill and Quarry Mountain are bare summit hills created by forest fires from a century ago. There are two lean to’s located in the Wilderness, both being very popular to backpackers. The shelters are located at Middle Settlement Lake and Middle Branch Lake. The make up of the hiking trails in this wilderness offer backpackers a chance to explore the area utilizing loop hikes. You can choose a number of loop hiking options in this wilderness, from shorter loops to longer, multi day backpacking loop hikes. Big Otter Lake Trail - (Blue, 7.8 miles) Thendara to Big Otter Lake. This former truck trail is now closed to vehicular use by 2 gate barriers at Thendara. Lost Creek Trail - (Red, 2.6 miles) Big Otter Lake Trail northerly to a dead end on Lost Creek. Lost Creek- East Pond- Link Trail - (Blue, 1.8 miles) Links Lost Creek Trail with East Pond Trail. East Pond Trail - (Yellow, 2.8 miles) Big Otter Lake Trail to East Pond via Little Simon Pond. Blackfoot Pond Trail - (Red, 1.0 mile) East Pond Trail to Blackfoot Pond. Moose River Mountain Trail - (0.7 miles) Old trail to site of the former fire tower. Middle Branch Lake Trail - (Yellow, 1.6 miles) Old Cedar Pond Shelter to Big Otter Trail. Middle Branch Lean-to Trail - (Red, 0.2 miles) Middle Branch Lake Trail to shelter. Middle Settlement Lake Trail - (Yellow, 3.7 miles) Site of the former Cedar Pond Shelter to Brown's Tract Trail via Middle Settlement Lake. Vista Trail - (Blue, 0.2 miles) Middle Settlement Lake Trail to top of a cliff. This trail is no longer maintained as the trees have grown to block the scenic view. Middle Settlement Lake Access Trail - (Blue, 1.2 miles) Middle Settlement Lake Trail to Brown's Tract Trail. This is a popular trail with hikers looking for the quickest route to the lake. Cedar Pond Trail – (Red, 2.2 miles) Brown’s Tract Trail to site of the former Cedar Pond Shelter. Grass Pond Trail – (Yellow, 0.5 miles) Cedar Pond Trail to Grass Pond. Scusa Access Trail – (Red, 0.6 miles) NY 28 parking area to Brown’s Tract Trail. Lost Lake Trail – (Blue, 3.8 miles) Middle Settlement Lake Trail to Pine Lake Trail via Lost Lake. Brown’s Tract Trail – (Yellow, 6.7 miles) Thendara to Copper Lake Road and then on to the extension of the trail that continues to a parking area off NY 28 on Conservation Easement Land.